Taylor Mac. Photo by Ves Pitts. Leave it to Taylor Mac to make me think about the baggage I bring to the theater. During his cabaret-style performance, Comparison is Violence, he firmly asked “What’s your agenda?” Referencing audience members, critics, Ziggy Stardust and Tiny Tim, his words charged everyone as guilty of comparison and having an agenda. Taylor Mac is right. We are guilty, even if we don’t admit it or feel ugly acknowledging the possibility. We all have an agenda when we go to the theater. It’s nothing to be ashamed of, since it’s a fairly natural state. Agendas are our expectations. If you didn’t have some expectations you wouldn’t go. There’s really no neutral way to show up to a dance performance unencumbered, so I’m not advocating for anyone to check their baggage at the door. I just hope we can remember what we packed. With performance, the actual live event is situated within a larger arc. Your encounter with a work begins the first time you hear of it. That’s when you begin to develop expectations. Who told you about the work? What images appeared on the flyer? What do the text or video trailer set you up to see? Have you seen the artist before? What do you expect from that particular venue? UC Berkeley Professor Catherine Cole led an illuminating discussion with a group about to see the Voices of Strength performance last October at YBCA, highlighting the expectations evoked just by the words contained in the title of the show and the advertising images. Every detail is loaded. Once you decide to attend a performance, is it because you want to be entertained? To have your worldview confirmed or challenged? To be surprised or just mingle socially at the particular gathering? Whatever the why, this is your agenda. Admit it. You have baggage you are bringing to the theater. Also consider how close or foreign the art form sits in relation to your personal experience and background. What’s the most recent work you saw? Similar to the concept of dance collecting through experience, which I discuss in an earlier post, We Are All Collectors, our baggage accumulates. What of your current joys or conflicts might color the expectations? Additionally, the voice of a journalist, critic or reviewer might be ringing in your ear. With media as a filter for the selection of how to spend one’s time in a culture of “Likes”, LinkedIn endorsements and Siskel and Ebert thumbs, I’m heartened by certain performing arts writing initiatives aiming to provide more than a recommendation to go or not. Philadelphia’s multifaceted Thinking Dance operates with the motto “Upping the ante on dance coverage and conversation.” Pop-up newsroom Engine 31 recently provided comprehensive coverage of the Humana Festival mobilizing a national team of reporters for a few days together. Portland’s FRONT magazine operates in a print and live event format merging performance and a parallel creative written output. Also, Claudia La Rocco’s Performance Club fosters experimental and poetic forms of written response to performance from guest writers. Danspace and New York Live Arts both employ writers in residence for contextual content, and just this week HowlRound announced the writers for their NewCrit initiative, skirting reviews in favor of broader more meaningful, critical conversation. Informed content can enhance expectations and add to one’s agenda in a positive light. Taylor Mac in Comparison is Violence. The encounter with a work lasts until the final time you think about it. I suppose you could even argue that the encounter lasts beyond the final time you consciously think about it, as exposure to the work becomes part of your overall life experience so its impact can actually linger in a more latent subconscious way forever. Nobody enters a performance completely neutral and open. What’s the baggage you bring to the theater? By drawing attention to personal agendas and expectations, Mac’s warnings preceded a strangely similar message to that of my yoga teacher just weeks later, creating an amusing collision of glitter, cabaret and Ujjai breaths. Tegan Schwab. Photo by Margo Moritz. On the heels of a March retrospective at Bryn Mawr College in Philadelphia, Susan Rethorst will visit San Francisco, hosted by Hope Mohr Dance’s (HMD) The Bridge Project. This initiative situates Mohr, an ODC resident artist, in the hybrid role of choreographer and curator, as well as community gatherer, since this year the project mobilizes Bay Area artists Katie Faulkner, Christy Funsch, Aura Fischbeck, Erin Mei-Ling Stuart, Deborah Karp, Phoenica Pettyjohn, Peiling Kao to perform with Mohr in Rethorst’s Behold Bold Sam Dog. This performance will share the bill with Mohr’s new work Failure of the Sign is the Sign (May 3-5), thereby framing Mohr’s dance by that of another artist. Reading this essay about Rethorst, which quotes the artist writing, “Pleasure and rigor are not mutually exclusive,” I’m reminded of conversations discussing Bay Area dance with colleagues from other locales. I’ve heard the criticism (and generalization) that while the density of artists in this city generate a lot of new work, sometimes it “lacks rigor.” Referring to improvisation in performance, I’ve heard mutterings such as “Why would I want to watch someone make something up onstage?” While much of the time spontaneous performance is structured by a movement score worked through during rehearsals developing tools for such live occasions, I’ve been at times engaged and other times dissatisfied by the result. Rigor is not always visible in performance. What is the value of process versus product? The pairing of Failure of the Sign is the Sign, Mohr’s work developed with Julia Kristeva’s ideas about language and selfhood, with Behold Bold Sam Dog, by Rethorst who uses writing to scaffold and mediate her creative process, offers a layered mode of absorbing the shared bill through the body and mind, movement and linguistics. The soft blue sculpture intertwined with performer Tegan Schwab’s limbs. Pleasure. The calculated structures of bodies tethered and released in balanced support. Rigor. In considering the pleasure and rigor of dance making, I think as audience members we should also participate in the pleasure and rigor of watching, which requires a similar attention and presence practiced by the choreographer. “I know that personality is just an invention of the news media. I know that character exists from the outside alone. I know that inside the body there’s just temperature. So how do you build your soul? At a certain point, I know, you have to forget about your soul and just do the work you’re required to do. To go on and on about your soul is to miss the whole point of life. I could say that with more certainty if I knew the whole point of life.” ­ – Sheila Heti, How Should A Person Be? In anticipation of Sheetal Gandhi’s Bahu-Beti-Biwi (Daughter-in-law, Daughter, Wife) opening the 2013 season at ODC Theater (April 19-21) in San Francisco, I’m reminded how personal hybridity and mashup identity shape our survival and presence as we move between environments and cultures. With the blurring of private and public identity encouraged by the widely accepted use of Facebook, as well as increased globalization and information sharing of the digital age, roles emerge more fuzzy than ever before. Sheetal Gandhi. Photo by CedarBough T. Saeji. Much of contemporary hybridity emerges from having more choice than previous generations – even choice about something as fundamental as a family unit. Urban dwellers in America, many living far from a birthplace and nuclear family, adopt chosen family members. Bay Area writer Ethan Watters considers these “urban tribes” the closely-knit communities of friends that spring up during the ever-increasing period of time between college and married life. At a time when American news outlets report low birthrates and delayed marriage, family life composes the center of Gandhi’s Bahu-Beti-Biwi, as she navigates expectations and priorities of women in Indian culture. 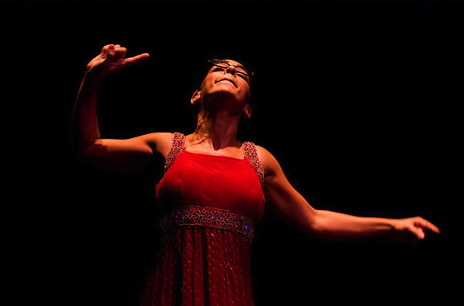 Regarding her artistic identity, Gandhi calls herself a choreographer-director-writer-performer (hello hyphens!). Navigating hybridity she writes in a 2009 reflection paper presented at UCLA, “I can relate with the culture of academia, Broadway actors, my Indian and Indian-American society, circus life, Chinese acrobats, and the particular preferences of each, with the same amount of ease and dis-ease.” While I believe the less shape-shifting we choose to do in the environments through which we transit, the more whole we can feel, Gandhi explores conflicting priorities as she traverses multiple spheres. 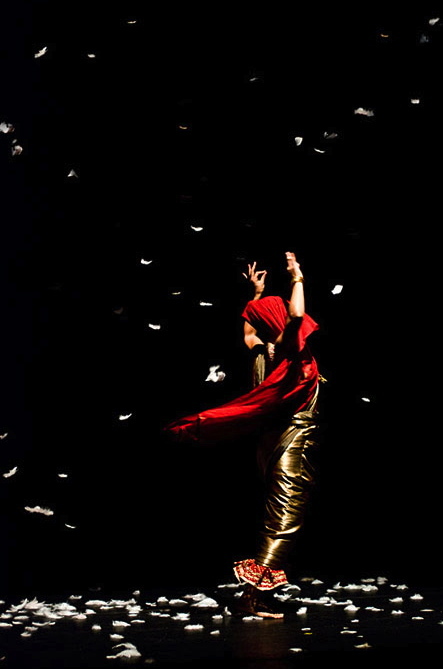 Hybridity of identity parallels Gandhi’s movement hybridity, and I look forward to experiencing the calculated undulations and precise gestures she draws from her palette of Kathak, modern and West African dance layered with vocalizations and text. A student of Donald McKayle, rhythm punctuates and textures her work. McKayle deeply integrated rhythm into his dancing. Influenced by Afro-Caribbean, Hindu, and Haitian, this musicality stems from his time in the late 1940’s with New Dance Group, a New York-based ensemble directed by Pearl Primus. At the University of Irvine, McKayle encouraged Gandhi’s playful nature and nurtured her capacity for rhythm. As a musician, she plays the Calabash, a dried gourd, and the West African Xylophone. To catch the shades of the North Indian form, Kathak, in her work, look for fast footwork, abrupt stops and languid symbolic arm and hand gestures. She also incorporates the polyrhythms of Ghana, where she studied in 1993. We should also consider Gandhi’s multiplicity of identities such as artist, teacher, student, traveler, circus performer and scholar, although they are less overtly represented in the work. The roles of daughter-in-law, daughter and wife, link women from around the world, although the expectations of these roles drastically differ from place to place. What does it mean to be a good daughter or wife? What roles are prioritized, and for what reasons? How do you live your hybridity? Finally, as Heti, ponders, how should a person be? Gandhi honors her family and North Indian traditions, but urgently dances her desire to break from certain elements of her culture. In this contradictory expression, Gandhi is contemporary in her mixtape. When considering the social and cultural context of dance making in San Francisco, the environmental factors created by the tech industry cannot be ignored. Encountering article after article during the past two years about the projected effects of the new tech boom, I’m inclined to mine specifically how the ephemeral art form of dance intersects with the reported transactional and consumerist ethos of San Francisco’s “new” economy. While the presence of tech has fired creative pursuits including media-based arts and data-visualization endeavors like The Creators Project the Gray Area Foundation for the Arts and The Bay Lights, the benefits for dance makers and body-based performance seem to be lacking. In addition, I wonder if the attention to digital art versus live art parallels this statement about a widespread atrophied capacity for live encounters with real humans meeting in time and space. Boom. The density of tech companies and resulting concentration of economic, social and cultural capital impacts how dance makers live and work. Lauren Elder, who worked with Contraband as the primary visual artist recalls the decade from 1985 as one of the hottest artistic periods the city has seen, including a plethora of visual theater companies and healthy competition among groups to make strong work. “It was easier to produce things then. People had more free time and the city was not the real estate hotbed that it is now. There were a lot more open spaces, vacant lots, abandoned buildings,” she recalls. Bust. The post-boom economy drove performance makers to have shorter rehearsal periods and conduct more project-based work. Due to the increased cost of living, many choreographers now spend more time on non-art labor than before the digital age to make ends meet. Some moved to academic settings with studio resources. San Francisco’s median income for a one-person household is $72,100 with low income being below $63,350 and very low income below $39,600 according to the HUD guidelines. While it’s not polite to talk about money, sometimes I wonder what the heck we dance people are doing here given the art form’s reputation for being a far from lucrative pursuit. And yet, the Bay Area’s dance community is the second largest in the country after New York City. Recent graduates of dance bachelors and masters programs flock here to take advantage of artist opportunities and incubation programs at venues acting both as service organizations as well as presenting entities such as ODC Dance Commons and the ODC Theater with Pilot and the resident artist program, as well as CounterPulse, The Garage and Kunst-Stoff Arts residencies and production support. Places to take class abound in the city with the San Francisco Dance Center, Dance Mission Theater, San Francisco Conservatory of Dance and the Joe Goode Annex. It’s not that there aren’t wonderfully generative dance organizations, studios and institutions in San Francisco –there are, and some have even grown since the advent of the digital age. Many of the dancers just can’t afford to stay local. Which brings me to the movement of artists into the East Bay. While there exists an undoubtedly strong presence of dance artists and artistic activity in the East Bay, Oakland is not the “Brooklyn of San Francisco” and performing artists who live outside San Francisco don’t benefit from major funders like the San Francisco Arts Commission, since artists have to be residents of San Francisco to apply. Also worth noting in terms of healthcare is that many San Francisco-based dance artists benefit from Healthy San Francisco, a citywide program providing accessible and affordable basic health care, not available in Oakland. What you gain in space and more affordable rent, you lose in other resources. So are there benefits of the tech boom’s impact for performance makers? If there are, I haven’t gleaned them yet, but maybe you can help me see the silver lining? San Francisco’s choreographers have rallied to continue making work here and longstanding dance organizations facilitate new development and nurture the imaginations and talents, even in less hospitable living circumstances for artists.